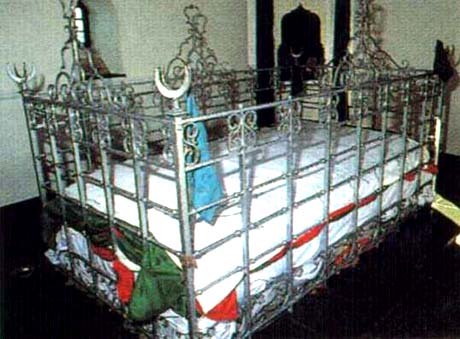 Cape Mazaar Society : The Cape Mazaar Society was formed in January 1982 initially for the upgrade and maintenance of the Shrine of Sheikh Abdurahman Matura (R.A.) on Robben Island. However the name chosen “The Robben Island Mazaar (Kramat) Society” was rejected by the old Prison Authorities. Changing the name to “The Cape Mazaar Society” meant that we now had to look at all the Kramats in the Western Cape as custodians. The Annual Death Anniversary celebrations of the Saint of Robben Island has grown from humble beginnings to gigantic proportions to date. At the first celebration only 20 participants were allowed on the Island. In September 2004, ± 600 visitors from all provinces of South Africa and a few from foreign lands participated. The Cape Mazaar Society was founded by His Eminence Hazrath Shaykh Sayyid Irfaan Ali Shah(may Allah Ta'ala rasie his maqaam and give him a long and healthy life) who is the master of many tariqah's. Some Ulema have stated that cape town is known as the Land of the Awilya.. There are also other Kramats around the Western Cape of whose history very little is known. 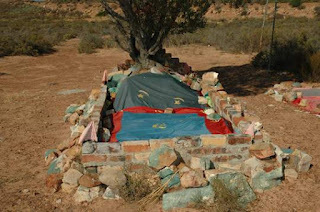 At Worcester, along the road leading from Rawsonville, the grave of Tuan Masud is to be found. What is known is that Worcester already had a Muslim slave population early in its existence and that a mosque to be built there in 1885. One of the earliest mosques to build outside of Cape Town. An Masud was probably one of the early Muslims slaves to work on the farms around Worcester. Caledon also has a Kramat. The man buried in this grave is Sayed Abdul Kader. The grave according to legend is mysteriously protected. During severe flood in this area, it was always the site which was never under water. The location of the bridge on the Caledon Road, adjacent to the grave, is said to have been forced upon the local Authority. They tried to cut the road through the grave, but to no avail. After several attempts they has no option but to build the bridge. Sheikh Yusuf was born at Macassar in 1626. He was also known as Abadin Tadia Tjoessoep. He was of noble birth, a maternal nephew of King Biset of Goa. He studied in Arabia under the tutelage of several pious teachers. When Sheikh Yusuf arrives at the Cape, on the Voetboeg, he was royally welcomed by Governor Simon van de Stel. His Indonesian background necessitated that he and his 49 followers be settled well away from Cape Town. They were housed on the farm Zandvliet, near the mouth of the Eeste River, in the general area now called Macassar. He received an allowance of 12rix dollars from the Cape authorities for support of himself and his party. At Zandvliet Sheikh Yusuf’s settlement soon became a sanctuary for fugitive slaves. It was here that the first cohesive Muslim community in S.A. was established. The first settlement of Muslims in South Africa was a vibrant one, despite its isolation. It was from here that the message of Islam was disseminated to the slave community living in Cape Town. 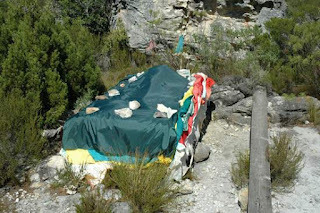 When Sheikh Yusuf died on 23 May 1699, he was buried on the hill overlooking Macassar at Faure. A shrine was constructed over his grave. Over the years this shrine has been rebuilt and renewed. Today it remains a place of pilgrimage.